Hello there! It's been a long time since my last post here (sorry about that). Unfortunately I don't have a concept to share today (sorry again), although I'm hoping to get back to my NHL Double Series soon. In the meantime, this is just a quick post with a couple of updates. First of all, if you've been on the main Templates page lately you've probably noticed I've started to add all the Adizero team templates. 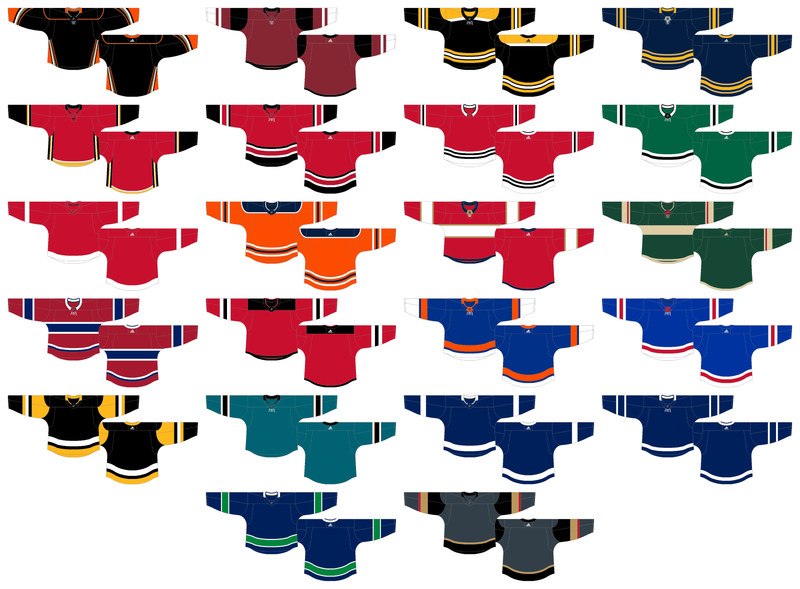 So far I've got 22 teams completed, and the other 9 teams will be coming sometime later (I'd like to have them all done before the start of the NHL season, but I'm not making any promises). Also, I've made an Adidas Adizero version of the Reebok Edge template from SportsLogos.Net (the template from the forum's Paint Users Paradise thread). All I really did (basically) was put the inner stitching of my Combo template inside of the SportsLogos.Net template. This template can be found on it's own page, called Extra Templates (there's a few different versions of the template for the different yoke styles and stuff). That's all for today, hopefully it won't be too long before I'm back again!